The XLERATOR is the first hand dryer ever to be awarded GREENSPEC� designation by the editors of Environmental Building News. XLERATOR meets a number of GREENSPEC� standards; it conserves energy, has low maintenance requirements and reduces waste. 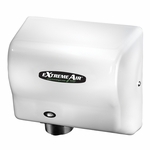 More simply put, by eliminating the need for paper towels, which saves trees and reduces waste, and by using 80% less energy than other dryers, XLERATOR makes your restrooms better for the planet.